We already knew Des and Trudy Kinloch when they contacted Mary about the Parliamentary Petition. Trudy was planning to be there when the Petition was handed over to Owen Paterson MP, so we asked them if they would be willing to supply a quotation to be included in the press release. Once the Owestry office of the Shropshire Star discovered someone from their area was involved, they contacted Des and Trudy for an interview. 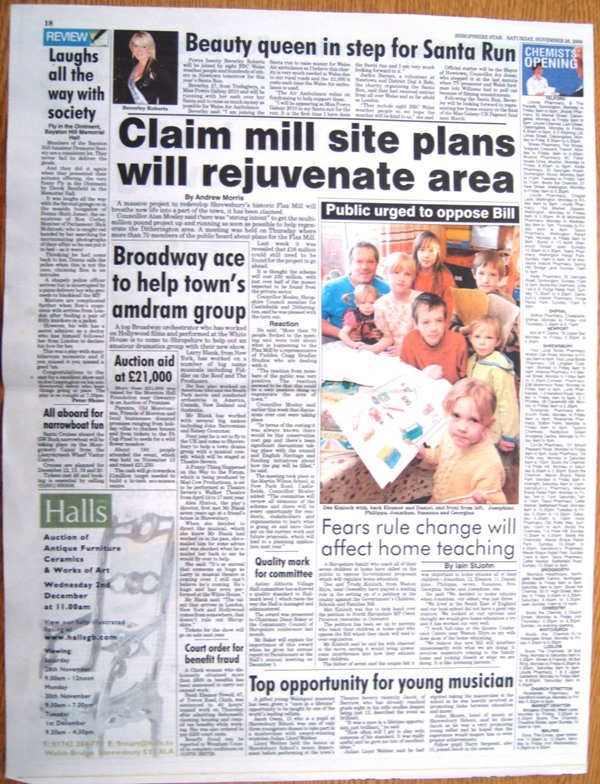 The article was published the day after the handover. A Shropshire family who teach all of their seven children at home have called on the public to oppose Government proposals which will regulate home education. Mrs Kinloch was due to help hand over the petition to North Shropshire MP Owen Paterson yesterday in Oswestry. The petition has been set up by parents who teach their children at home and who oppose the Bill which they claim will lead to over-regulation. Mr Kinloch said he and his wife objected to the move, saying it would bring unwelcome interference into how they educate their children. The father of seven said the couple felt it was important to home educate all of their children-Jonathan, 12, Eleanor, 11, Daniel, nine, Philippa, seven, Susanna, five, Georgina, three, and Josephine, one. He said: “We decided to home educate when Jonathan, our oldest, was just three. “I work full-time at the Quinta Conference Centre near Weston Rhyn so my wife does most of the home educating.